Hey do you like zambies? 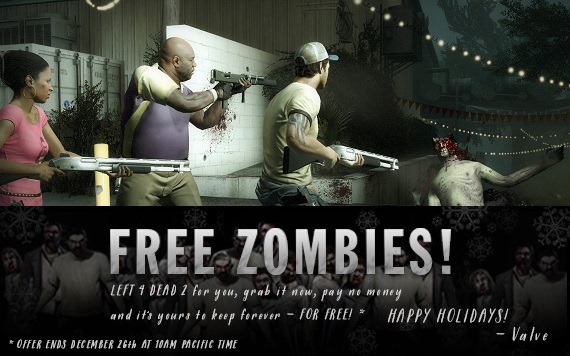 How about free zambies? That’s exactly what Valve & Steam is offering right now: a free copy of Left 4 Dead 2 to keep forever – if you get it within the day or so. (December 26th @ 10AM Pacific Time to be exact.) This is both a Christmas gift to all users of their digital distribution platform, and a way to get people to download and use it as well. (Though technically, us L4D2 owners who bought the game originally don’t get any treats.) Anyway, the team-focused online zombie survival shooter is still quite a blast to play – if you can find people who can communicate and play with this late into the game’s life span. Now if they only added zombies with elf outfits and Santa hats, then it’d be perfect.